Remember the function served by plants and structures is more important than their appearance. In other words, don't base your planting decisions solely on what a plant looks like. 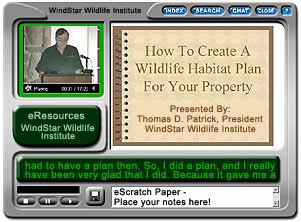 Following are WindStar Wildlife Institute's plant recommendations for wildlife habitats in New Mexico. The eastern third of New Mexico is covered by the Great Plains. The Great Plains run from a high plateau in the north south to the Pecos River. Rivers in the high plateau have cut deep canyons into the landscape. South of the Canadian River, along the eastern edge of New Mexico, the land is referred to as the High Plains or Staked Plains (Llano Estacado). In the central part of New Mexico, the Rocky Mountains extend into New Mexico from Colorado to the north. The Rio Grande River cuts through the Rocky Mountains from north to south. East of the Rio Grane, is the Sangre de Cristo (Blood of Christ) Mountain range. To the west of the Rio Grande are the Nacimiento and Jemez Mountain ranges. The fertile Rio Grande Valley provides suitable farm land using modern irrigation techniques. The Basin and Range Region covers about one-third of the state and lies to the south of the Rocky Mountain Region. This region extends south from around Sante Fe to Mexico and west to Arizona. This area is marked by rugged mountain ranges, such as the Guadalupe, Mogollon, Organ, Sacramento, and San Andres mountain ranges, separated by desert basins. The Native Plant Society of New Mexico can provide lists of plants for a specific region.